This page has several parts. Carolyn first submitted in September, then added more personal information and a couple of fun photos in February. Most recently, she gave us a report on the 124 mile bike ride she has just completed. That account is at the bottom of this page. What a wonder site! I was shamed into checking in again and signing in. This is so much fun -- much better than clearing off my desk! So many names I remember from the past! I stay very busy -- still working part-time, helping with our oldest daughter who is not able to drive and needs assistance as there is no public transportation in NW Houston (Cypress). I also help with my sister, Judy, who is in the final stages of early onset Alzheimer' Disease. She has been in the "final" stages for about 1 1/2 years now and is still healthy physically. She cannot see or talk (says 1-3 words occasionally). I think she knows who I am. It is so hard to watch your little sister wither away. When we were making plans to move back to Houston in 1997 from our 24 year stay in Louisville, KY, friends asked us “what does Houston have that Louisville doesn’t?” I usually answered: heat, humidity, bugs, and traffic. Then they wondered why we would move. But the biggest calling card was family. When we did make the move the thing that I had the hardest time adjusting to was the traffic! I have learned to adapt to it most of the time, but it never ceases to amaze me what I will see while driving here. 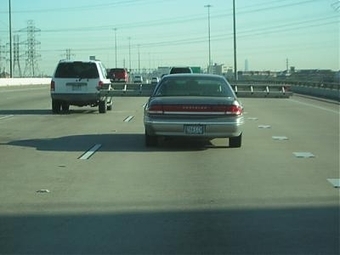 We live in Cypress (NW side of Houston) and my sister lives in Holly Hall retirement center just across Fannin from the Astrodome – so I drive the freeways often. 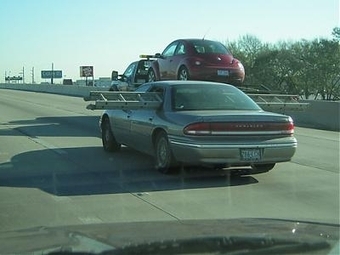 My brother (a photographer in Waco) just sent me these photos this morning of “A new low in stupid drivers...” Bob said “a photographer in Houston posted these yesterday. A friend of his wife took these pictures on Hwy 59 on her way into work”. This is a confirmation of my frustration/amazement of driving in Houston! Carolyn first introduced us to her world of bicycle riding with this comment on "A Place for Misc. Thoughts." I have recovered from the big ride except that I am still as hungry as a horse. I think it is time to cut off the excess eating! 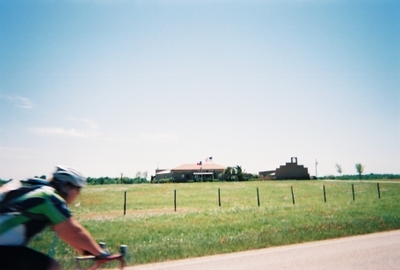 The thing I will remember most about the 2008 MS150 ride will be the constant wind. We had headwind almost all the way. Some sections there was a cross wind. The wind gusts were so strong at times that I could hardly keep going. As I made the final turn toward the fairgrounds in La Grange on Saturday evening, the wind disappeared. What a blessing for the last mile or two. This year I started the ride in Waller, TX – a new official starting point for the ride. It is closer to where we live and it was about 25 miles shorter than starting at the main team starting line at Tully Stadium. That seemed like a good idea, but we had to start 2 hours later than they started and the first 25 miles were very bad roads! I was saddle sore before I got to lunch the first day. Saturday night it got pretty cold in the tent (low 40’s I think). There were no early risers in our tent. Many previous years more than half the riders in the CenterPoint tent are dressed and ready to ride when the lights come on at 5 a.m. This year it was hard to get everyone moving! I went out to line up at about 6 a.m. and the line was not long at all. I ended up walking all the way around the fairgrounds to what was supposed to be the official start for the “Express route” to Bastrop – as opposed to the route that does the severe hills in Bastrop State Park. I did not have to wait long after they started letting people out the gates at 7 a.m. I rode the first segment okay – very cold but not much wind yet! I had on my long pants, long sleeved undershirt, ear-warmer headband, long fingered gloves, and a windbreaker jacket. My fingers and face were freezing! I made it to the first rest stop okay, but did not feel like I had as much energy as the day before. When I reached the rest stop, I got very light headed. I went to the SAG line (“support & gear” – or get in a truck/bus and ride to the next rest stop!). It is usually easy to get a SAG early in the day before everyone gets too tired or hot. Not last Sunday! Lots of folks were feeling the wear and tear of Saturday’s wind. I caught the first bus but it went all the way to Bastrop (3rd rest stop) rather than to the next (2nd) stop. I needed the break, but I missed the best long downhill of the whole ride by doing that. I ate some oatmeal cookies while on the bus and I felt much better when I arrived in Bastrop. I picked up lunch and stuffed it in my pockets as I was not hungry yet and that is the only stop with lunch. I shed most of my warm clothes and tied them to my camel back water pack. I really looked like a tramp, but was ready to ride. I was able to finish the rest of the day. I did not have to walk up any of the hills, but I did take some unscheduled rests stops at the top of a few hills. I had two energy gels in the last 20 miles and made into Austin feeling pretty strong. As I arrived in the traffic and hills of the city, I was not in a tight bunch. We were nicely spaced out. Not so scary! I was very glad to see the finish line and to give my bike to the truck driver who carried it back to Waller where I started. This year my total mileage was only 124 miles – a lower mileage than in years past, but I felt like I worked twice as hard. I guess I better start training now for next year! Thanks for your support and prayers. 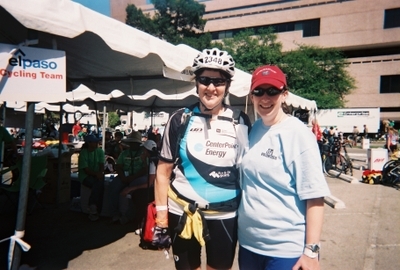 My MS rider partner was Suzanne Mikeska and I am sure she thanks you too!